I think that Echo Volume 1: Approaching Shatter, is meant to be an episode of an over arching story rather than a story in its own right. It introduces Atriya, the almost-perfect soldier protagonist, and the world of Echo, but the story stops just at the point where things become interesting. I really enjoyed what I read, and I will be buying the rest of the story when it's completed, but I wish I'd begun reading it with the expectation that it was a serialised story rather than a standalone. I have no objection to serialised stories, but I do prefer to read them all in one hit once they're finished. And that is what I will do with Echo. Well written, interesting main character, interesting world, interesting history and culture. 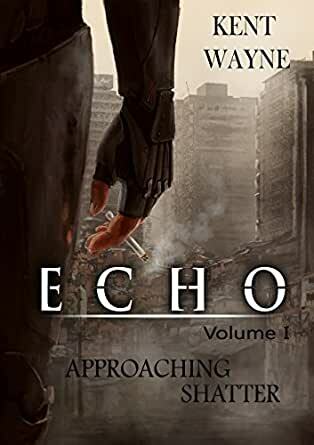 I just finished reading Kent Wayne’s novel "Echo Volume 1: Approaching Shatter." I knew it ended on a cliffhanger, but I didn’t realize it would be so abrupt. It was like slamming into a brick wall at sixty miles an hour. I’ve been reading it on my Kindle Fire and the thing said I’d finished something like 86% of the book. When I swiped to turn the page at the end of a chapter, I was confronted with a message stating it was the end of the story and if I liked it, to write an Amazon review. The rest of the book is a preview of "Volume 2: The Taste of Ashes." Somewhere in the creation of my blog and writing stories, Kent Wayne took notice of some of the things I’d authored by “liking” them, and so I checked out and eventually followed his blog "Dirty Sci-Fi Buddha." That’s how I became aware of his Echo series. My understanding is that “Kent Wayne” is a pen name (Clark Kent, Bruce Wayne), and I recall reading one bio on him saying he had military experience but preferred not to give out details, making Wayne and what he did in the service a bit of a mystery. That may seem irrelevant, but I do have a point to make. He does go more into his history on his blog’s About page, and "Echo: Approaching Shatter" definitely gives the impression that Wayne is mining his own professional experience. I had a tough time getting into the novel. It’s not like I’m opposed to military based science fiction. I’ve read and thoroughly enjoyed Joe Haldeman’s "The Forever War" and Timothy Zahn’s "Cobra," but that was decades ago. For about the first half of the book, I kept struggling for a handle or a hook and couldn’t find it. I didn’t know whether to even like the protagonist Atriya (and mentally, I kept pronouncing his name as “Attila”). The biggest criticism I’d have to give this story is that Wayne tends to get bogged down in long, tech-heavy explanations of equipment and procedure. It sometimes takes pages to describe how a single tool works. I found myself almost unconsciously skimming over those parts, which isn’t a good thing to make your reader do. If this were happening on television, it would be like watching an episode of the original "Star Trek" series and having Mr. Spock take five minutes to explain to the audience what a phaser is and how it works. On the actual show, they just fired phasers and let the viewers figure out what they did. I said above that the story ends on a cliffhanger, but that’s not quite right. A cliffhanger is, as the name implies, the end of a story where our hero is in a desperate situation and probably about to die (like hanging on the edge of a cliff and starting to lose his/her grip). We are left to wonder how he or she is going to survive this, so much so, that we buy the next book or watch the next broadcast or film. "Approaching Shatter" just stops at the end of a chapter, like all the other chapters. Sorry, but that was the novel’s most defining characteristic. I did say that I was slow to get into the novel but I eventually did. As Wayne tells you more about Echo, a planet colonized by “Old Earth” a thousand years ago, the society gradually takes shape. For the longest time, I didn’t know why the Dissidents even existed and what they objected to. It was only toward the end of the novel that things began to “click” for me. I finally realized that Atriya and his comrades may be on the wrong side. I understand this is Wayne’s first novel, and since I’m only starting to get into fiction writing myself, I can appreciate that this is no easy task. Getting a story to hook the reader from the start, pulling them along in the narrative, creating realistic and compelling characters you identify with, is all difficult and complex. 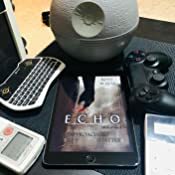 As I said above, I can see Wayne leveraging his own military experience in the writing of this book and presumably the rest of the Echo series, and I hope that in subsequent novels, he gets better at balancing explanation and characterization. Yeah, if your character is using a ray gun instead of a Glock, you have to say something about it, but on the other hand, unless it furthers the plot, you don’t have to go into every intimate detail about the weapon. Wayne tended to do the same thing when describing individuals and relationships, drilling down into, in my opinion, way too much detail in many cases, while at the same time leaving me with an incomplete picture of most of them. Maybe it’s that Wayne told me a lot about them, but didn’t let me experience them. I know that’s tough to pull off, but your characters won’t seem like real people otherwise. That said, one of my sons served in the Marines, so based on how he relates his experience, Wayne does accurately portray the camaraderie and the competition (and the adversarial relationships) within the service, illustrating both the loyalty to one’s mates and the desire to crush the more hostile and manipulative people you are forced to work with (or under). In spite of my criticisms, by the novel’s end, I really wanted to find out what happens next. Even if it didn’t end with such a screeching halt, I’d want to know how Atriya’s quest to figure himself out resolves (or if it ever does). I guess that means he stopped being fictional and became real. I think Atriya needs to become real to himself, though. He’s like a person who is fictional in his own mind, like someone trying to decide what he wants to be when he grows up. Yeah, he chose a career for himself and drove himself hard to become Crew. But I don’t think that’s where he is really supposed to be. Maybe Volume 2 sheds some light on that. I’ll have a look at those preview pages and see what comes next. Kent Wayne's Echo Volume 1: Approaching Shatter, was an enjoyable, gritty piece of military sci-fi. It certainly wasn't what I was expecting, but that's not a criticism. I was expecting blood and guts military action, maybe something with aliens bugs exploding left and right, but what I got was a deeply personal story of an elite soldier coming to a turning point in his life and his career, re-examining his own assumptions and values. Don't get me wrong though, there's still enough action to keep the pages turning. Far in the future, Atriya is an elite soldier, part of the Crew, a specialized unit that uses advanced technology to transform themselves into super-soldiers in their fight against the Dissidents. He's one of the best. And yet, something is missing. Guided by his friend and teacher, Verus, Atriya begins searching for a deeper meaning in all of it, and a deeper purpose in his life. When he makes a powerful enemy in an officer with political and religious connections, he's forced to make a difficult choice that will change his life, no matter what he decides. The sci-fi elements are well done. Kent Wayne has created a deep, coherent universe. The technology, the history and the cultures make sense, and the author's military experience gives the material a hard, realistic edge. In fact, one of my only complaints might be that the author spends too much time describing the technology. The character elements are also excellent. Most of the story concentrates on Atriya, and I really felt invested in this character. I sympathised with him and cared about the outcome. The story, as other reviewers point out, does end with a cliffhanger, which is a little frustrating. But that's the point of a cliffhanger, isn't it? You're supposed to be frustrated, so you want to read the next book. And I certainly do. Kent Wayne is a newer author, and the quality of his writing can be inconsistent at times, and a little heavy with narrative exposition. But none of that was a deal-breaker. The proofreading was nearly flawless, and the book was entirely readable and enjoyable. I look forward to the next book in the Echo series.